This southern transplant is ready to bring that white-hot heat to Houston, Texas. It’s a Land Cruiser that makes a bold entrance in black and white, with timeless details that bring you back to the early 80’s. 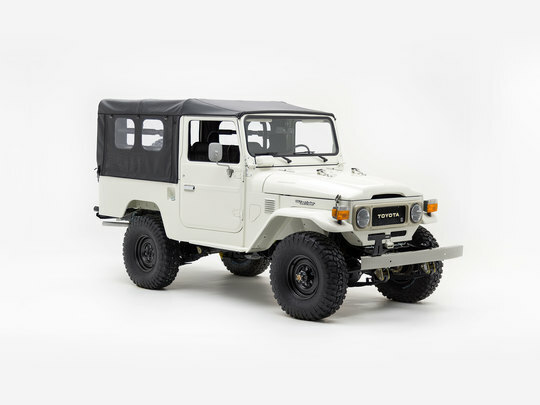 This Land Cruiser’s decade-old armor may be the stuff of legend, yet it has a look and an attitude that feels so “now”. That black and white contrast. Those big bold tires. That custom soft top with the small swing-out door in the back. A Land Cruiser with all the hallmarks of our client’s unique personal style. The Toyota 2F was one of the engines that started it all for Toyota, and here, it’s been fine-tuned and rebuilt for more urban adventures. Mated to a 5-speed manual transmission, it now runs smoother than ever — and with front disc brakes, advanced power steering and upgraded suspension this Land Cruiser is the one ride our client will want to drive everywhere. But should he decide to take his adventures off-road, he can do so confidently with the on-demand traction of ARB Air Lockers. Inside, the black and white design scheme of the exterior comes full circle in a custom-tailored cabin that has all of the character and elegance of a black and white photograph. Here, metallic trim and dark gray marine grade vinyl upholstery contrast beautifully with blacked-out classic details and a pristine white metal dash, while modern amenities reveal themselves in unexpected ways.